One of the frustrations of eating out in the Basel area is the lack of ‘ethnic’ food that’s a) authentic and b) sensibly priced. In March I reported on Café Tacuba, a new(ish) place on Malzgasse that serves pretty good Mexican food – vanishingly rare round here. I’ve just been to lunch there again and enjoyed it famously. In the past, the day’s specials were a bit of a mishmash of Mexican and vaguely Asian dishes. Now the place has got into its stride and gained the confidence to go full-on Mexican, even at lunch. The house guacamole (pure, unadulterated avocs, cilantro, chile and lime with good texture and fine flavour) is very nearly as good as mine, and is served as an amuse-bouche with totopos. Then I had a heap of succulent prawns in a chipotle sauce – the shellfish was tasty and succulent (i.e. not overcooked) but the sauce (based on one of Mexico’s finest chiles, ripened, dried and smoked) could’ve been hotter both spice- and temperature-wise. My lunch companion declared himself well pleased with his beef tacos, tender meat, nicely underdone, enfolded in soft tortillas. Both dishes came with ‘refried’ beans and rice and warm tortillas can be requested on the side. 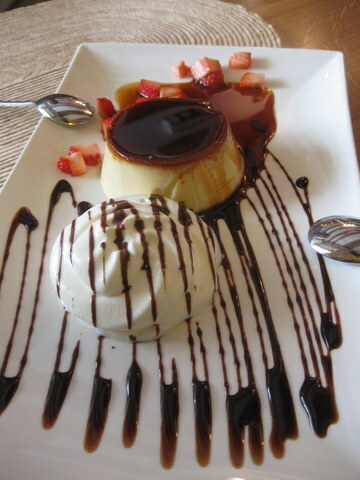 The waiter persuaded us to share a flan (pictured above) for dessert, and we capitulated, gracefully. Plump, smooth as silk with a deep burnished caramel top, I’d swear it was made to the recipe by my Mexican friend and hairdresser Socorro, which has both condensed and fresh milk (recipe in my book, The Mexican Cookbook). Tacuba adds chopped strawberries on the side and then goes slightly – but nicely – OTT with some whipped cream and a stippling of chocolate. Service is fun, friendly and fairly efficient, the food is the real thing and it’s nicely presented. There are even a couple of tables on the pavement outside for whenever the sun decides to come back to these parts. Lunch for 2 (guacamole on the house, 2 mains and 1 shared pudding) with a couple of Pacifico beers and a coffee set us back CHF80 (ca. €66 nowadays) – unbeatable value in this part of town and for that quality.